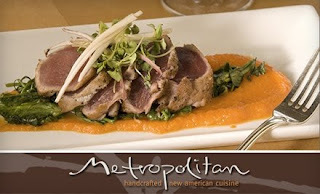 If you ever wanted to try the Metropolitan, now would be a good time. The Groupon today is a $50 Gift Certificate for $25 to the Metropolitan!! Limit 1 per person, but you can buy more as gifts if you want. See details here. I've always wanted to go there and now I'm gonna! Groupon is super easy, I've used them a few times now and LOVE IT!